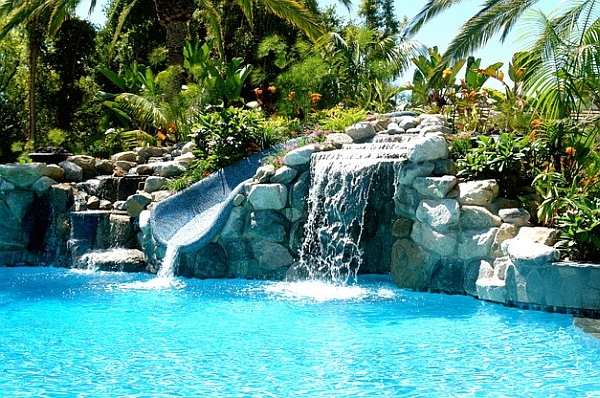 Sitting lazily next to the beautiful pool and sipping away at your favorite beverage is one of the first images that comes to mind when one thinks about lovely holidays. 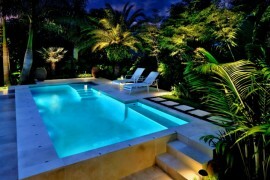 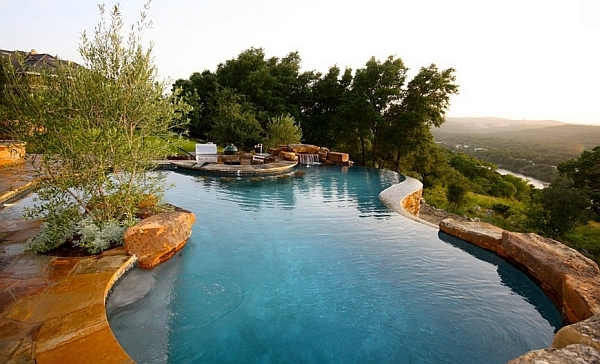 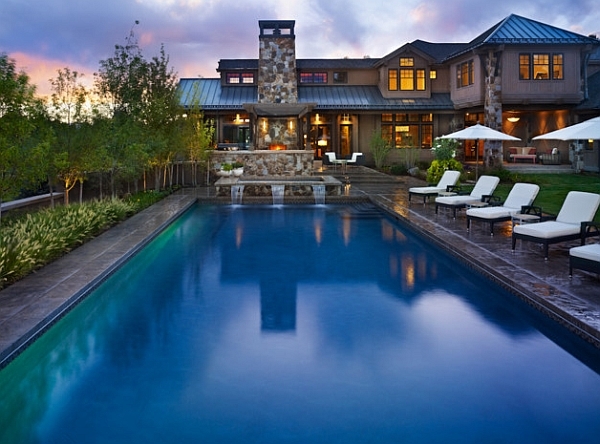 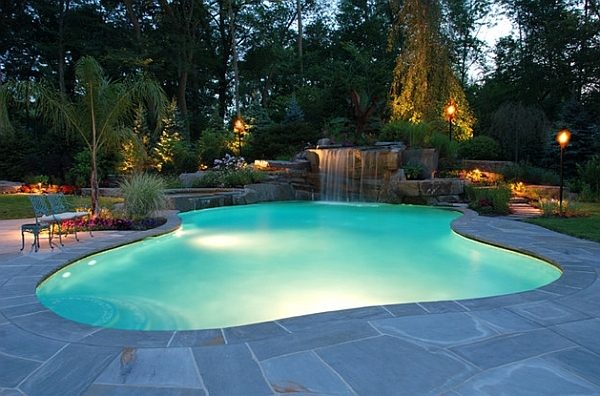 Swimming pools have become synonymous with relaxation and rejuvenation. 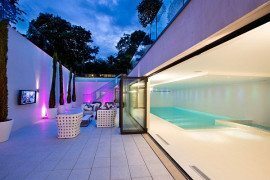 This is one of the obvious reasons why they are increasingly becoming an integral part of stylish modern homes. 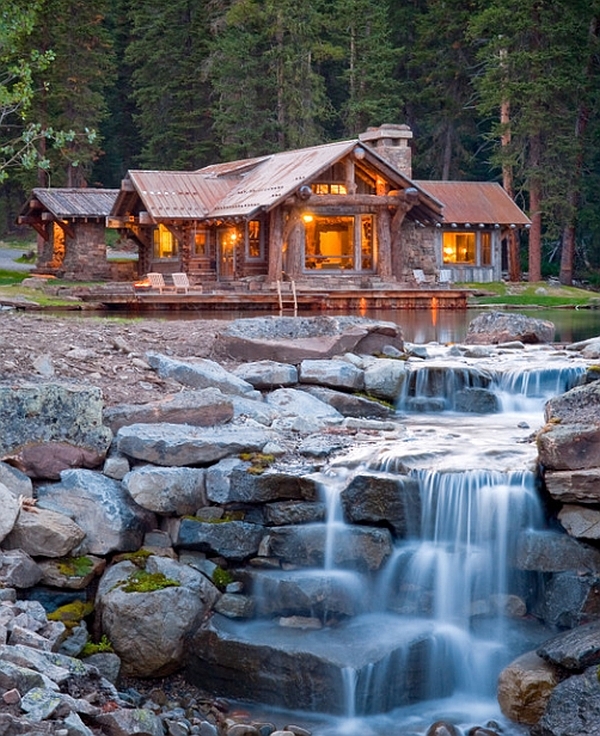 Why not take this amazing outdoor experience a notch higher with a stunning waterfall feature that promises to take your breath away? 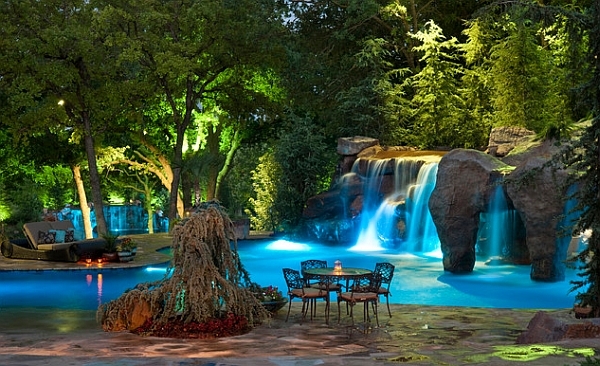 Apart from creating a spectacular visual, pool waterfalls also enhance the ambiance of your outdoor design with their soothing presence. 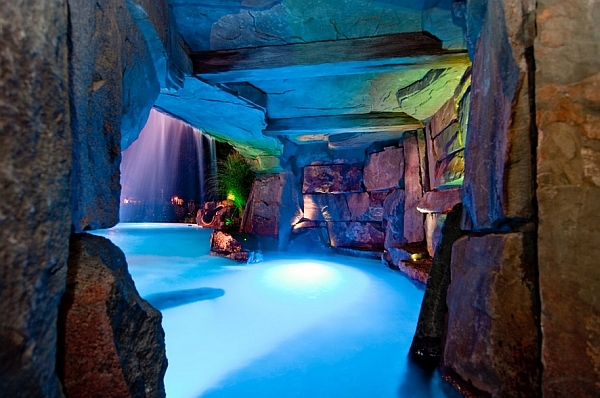 Extensive rock grotto includes a swim-up bar! 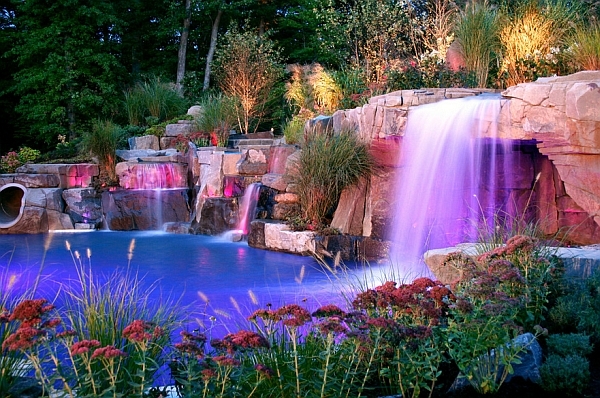 Waterfalls most often are coupled with a brilliant tropical ambiance or a cool Mediterranean setting to fashion a truly outstanding landscape. 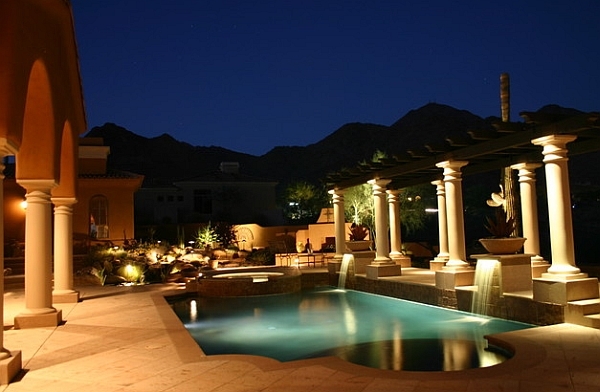 Designers often employ natural stone along with faux rock in an attempt to create a versatile setting that is as close to the real thing as possible. 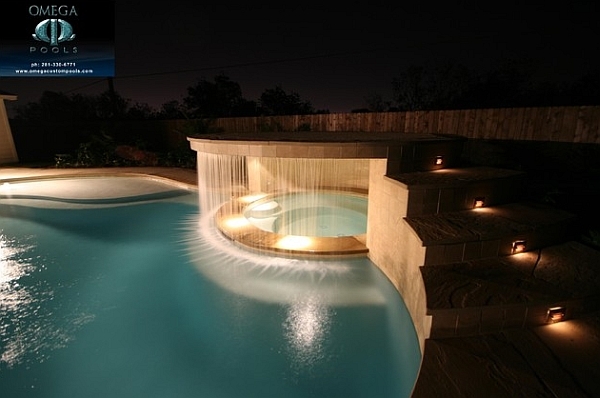 With modern technology allowing homeowners to control the speed of the water flow, the various streams and also the LED lighting, the visual of a dynamic pool waterfall can be altered instantly depending on your mood. 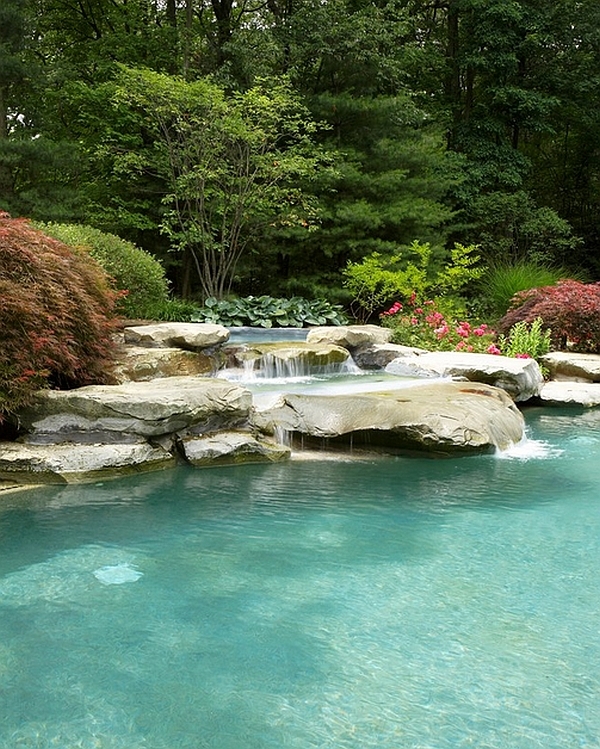 Apart from the rock you choose, greenery also plays a pivotal role in defining the appeal of your pool waterfall feature. 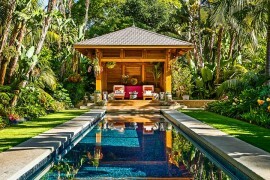 While combining plush poolside seats with this setting helps shape a more modern vibe, one can opt for a thatched roof hut or a classy cabana to craft a striking and inimitable escape in your own backyard. 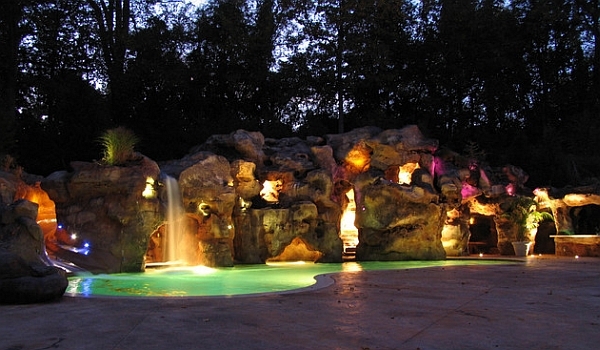 Waterfalls and grotto design comes with 32 custom-created light shows! 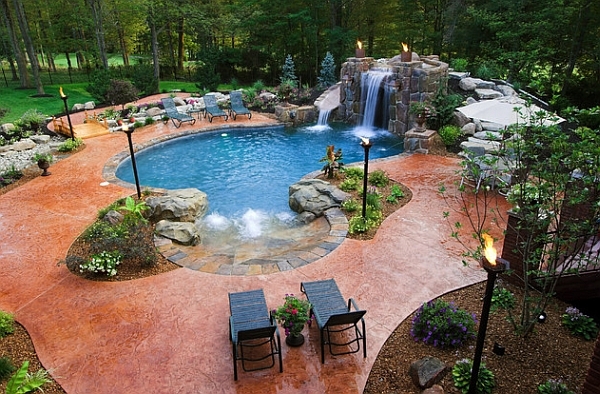 Beauty of nature brought to your backyard in style! 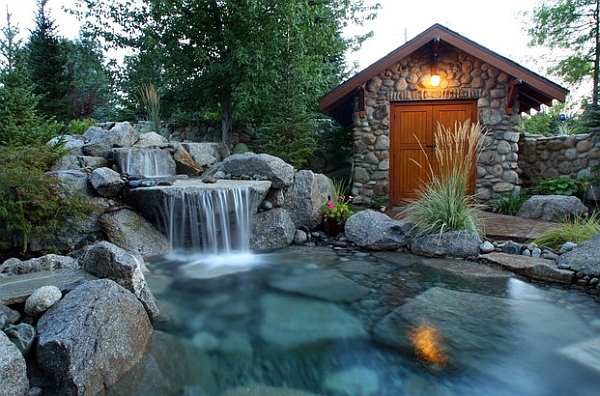 Large waterfall features also give you a wonderful opportunity to create remarkable grotto structures that can exude a mystical aura when coupled with the right lighting. 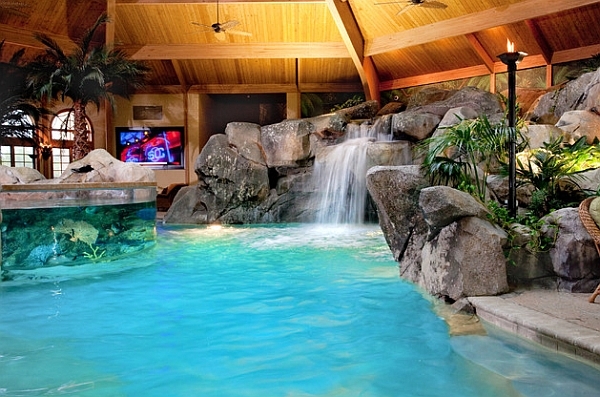 Some of the marvelous waterfall grotto designs on display here also feature trendy swim-up bars, serving areas and hangouts that offer a relaxing hideout. 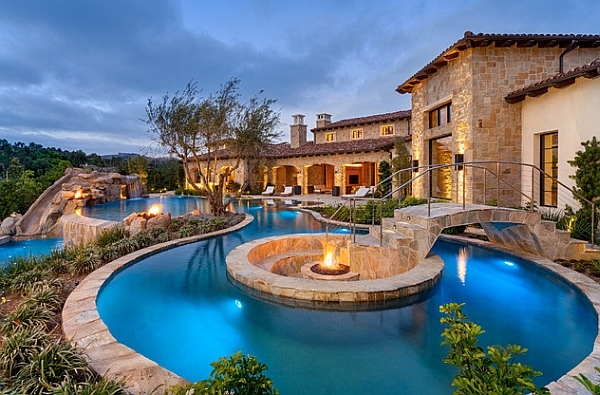 Complete with spiral staircases and hidden rooms, you will be amazed by the fairytale-esque designs! 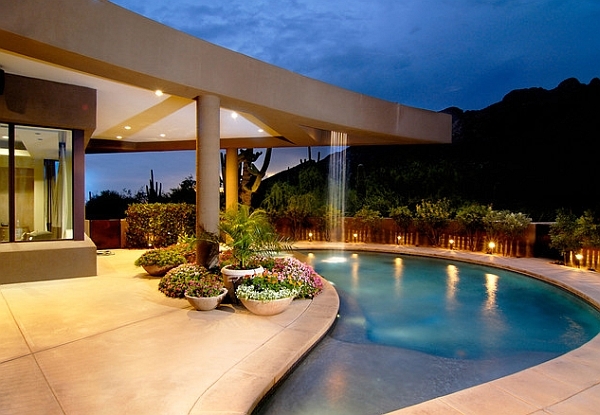 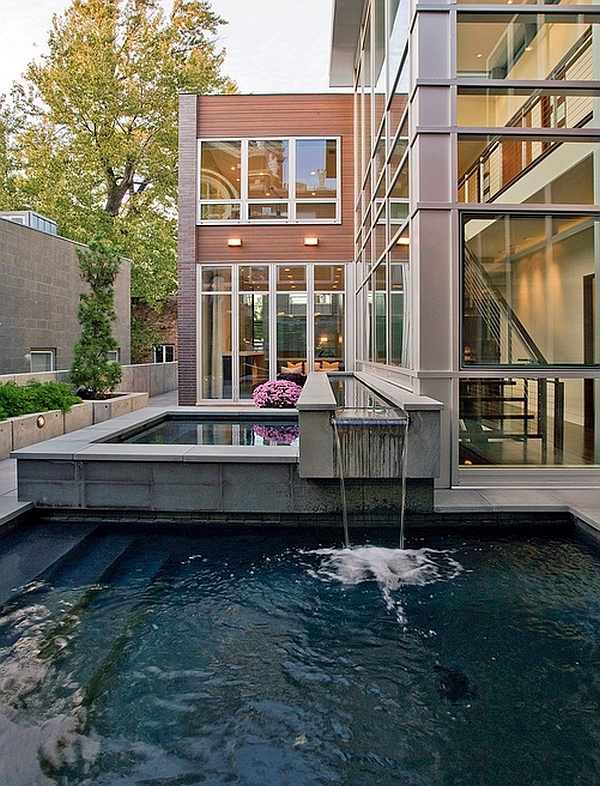 An expansive water feature like this could set you back by a good million dollars! 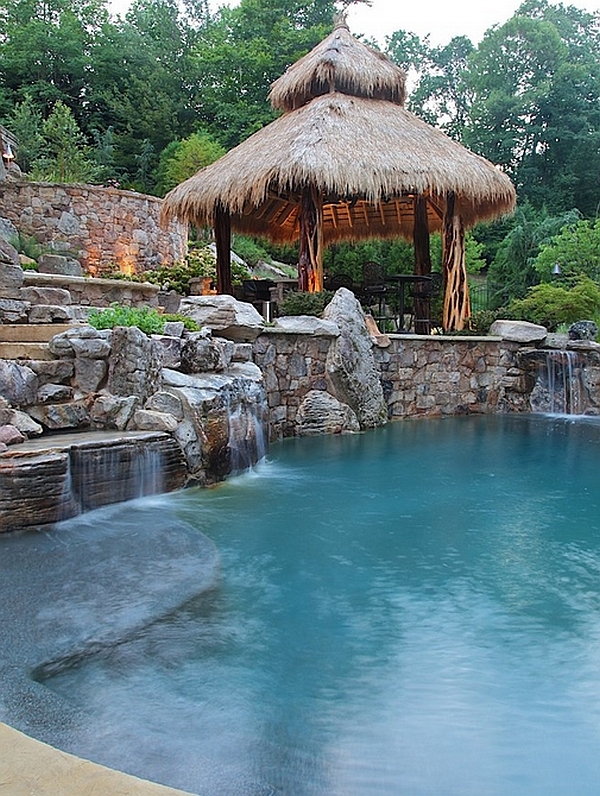 Bring home the brilliant tropical retreat! 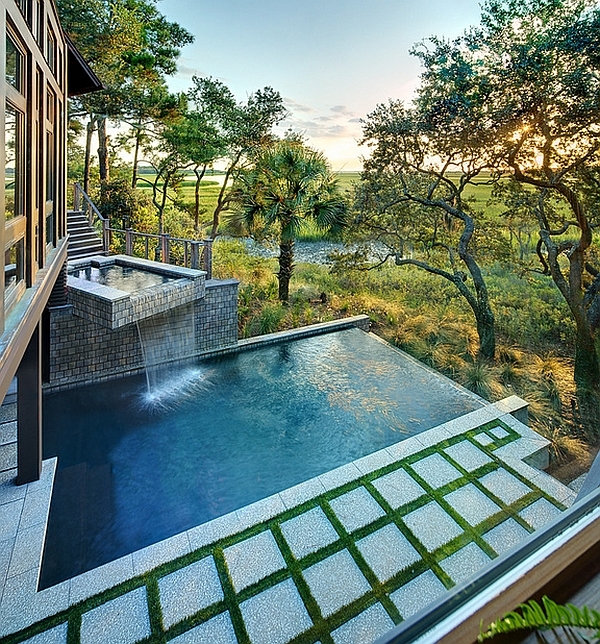 Ingenious pool waterfall designs can delve into a realm that is beyond the obvious. 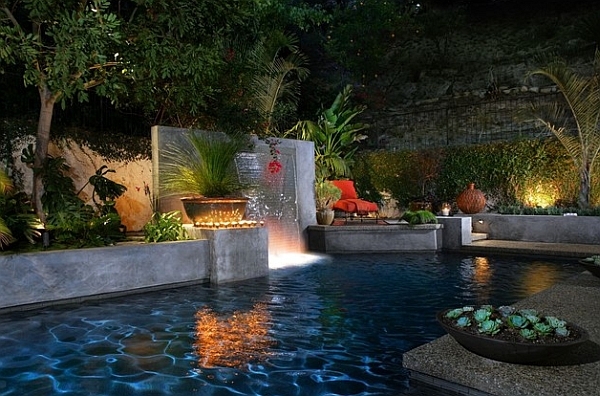 Adding both visual and textural contrast to your outdoor space, these waterfall features vary from overflowing fountains to structures that are flanked by playful water slides. 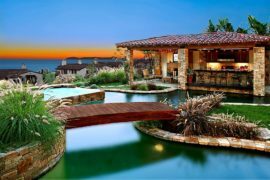 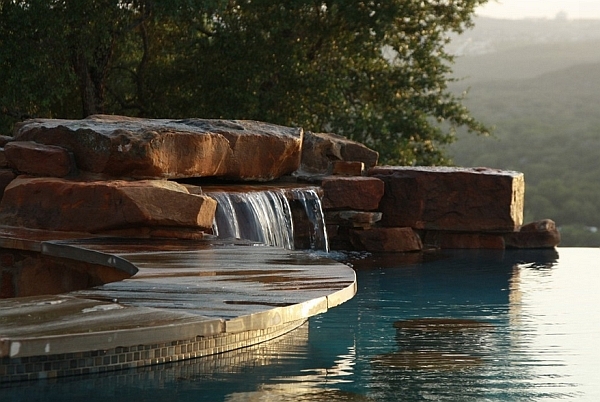 Instead of focusing on one large waterfall that uses natural rock, these custom creations fit in perfectly with their modern surroundings and enhance the style quotient of your pool deck. 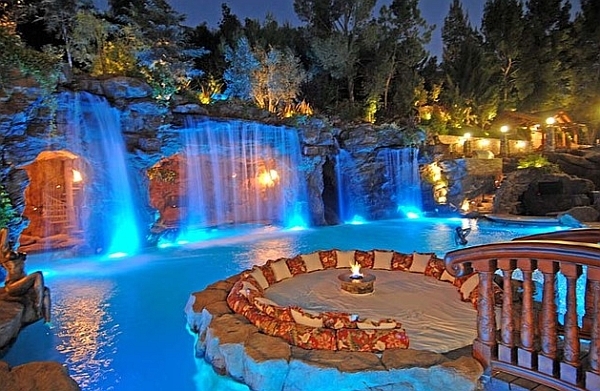 They tell you that not all waterfall designs need to be massive and spectacular. 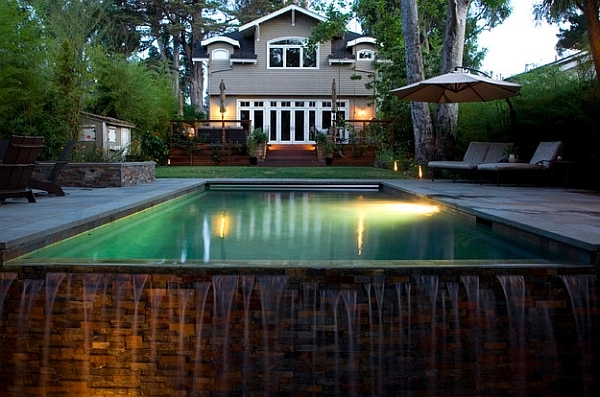 At times, understated class works equally efficiently! 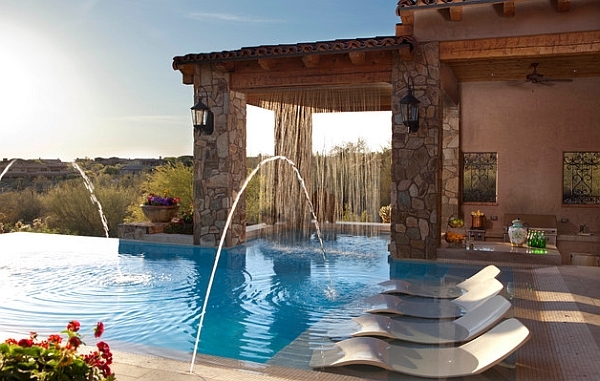 Is it a fountain or is it a waterfall? 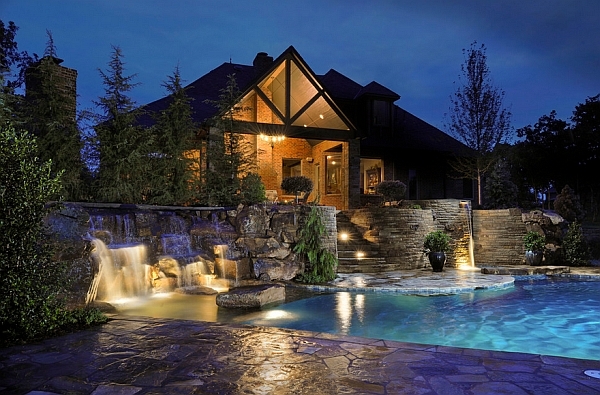 If you wish to incorporate a modest waterfall feature, do not limit yourself to the conventional styles. 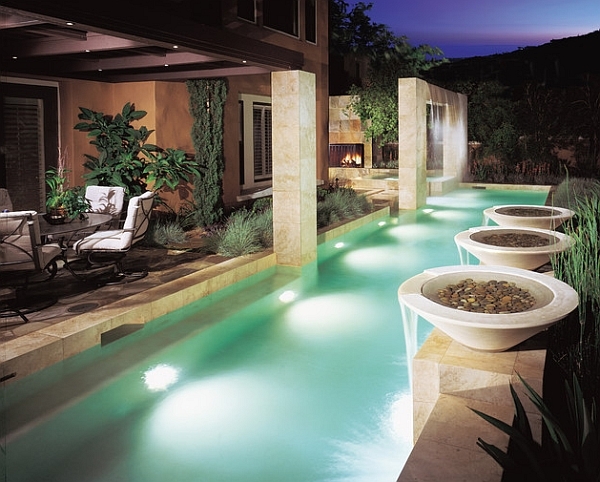 Use small, elegant overflowing bowls or even stylish custom water screens to create an outdoor ambiance that seems like a natural extension of the indoor space. 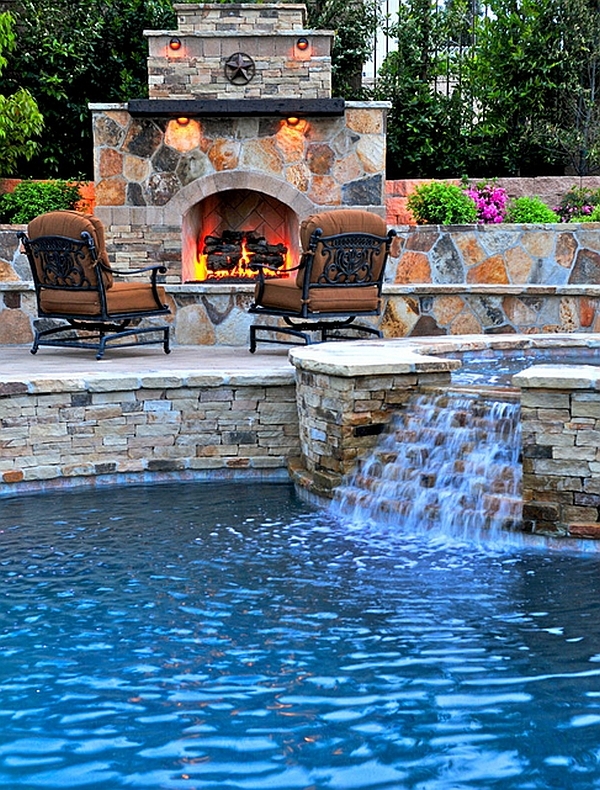 Add a fireplace next to the pool and a lovely pergola to complete this graceful look. 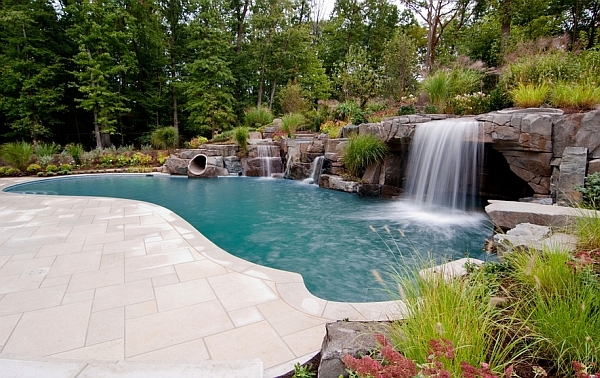 Remember that the waterfall feature you choose must fit in effortlessly with the larger design theme of the backdrop. 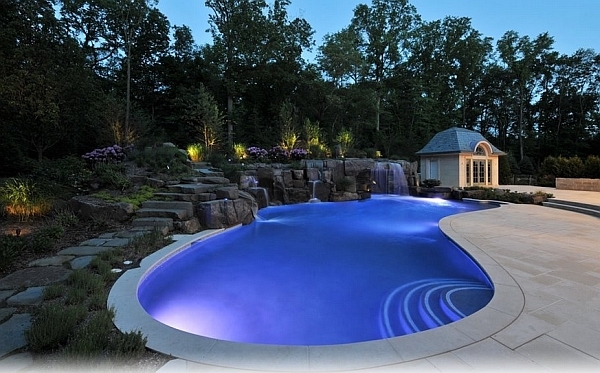 Not a fan of the extravagant and the bold? 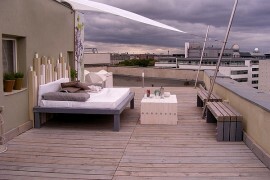 Then take the semi-minimalist style that you have adopted for the indoors outside. 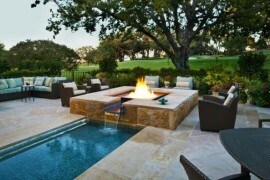 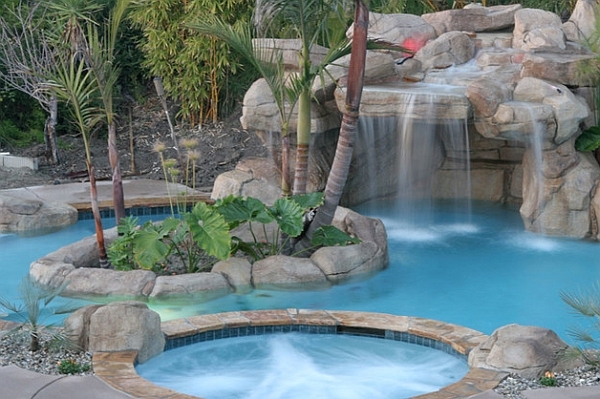 A pool waterfall that is both chic and classy can be achieved by keeping things simple. 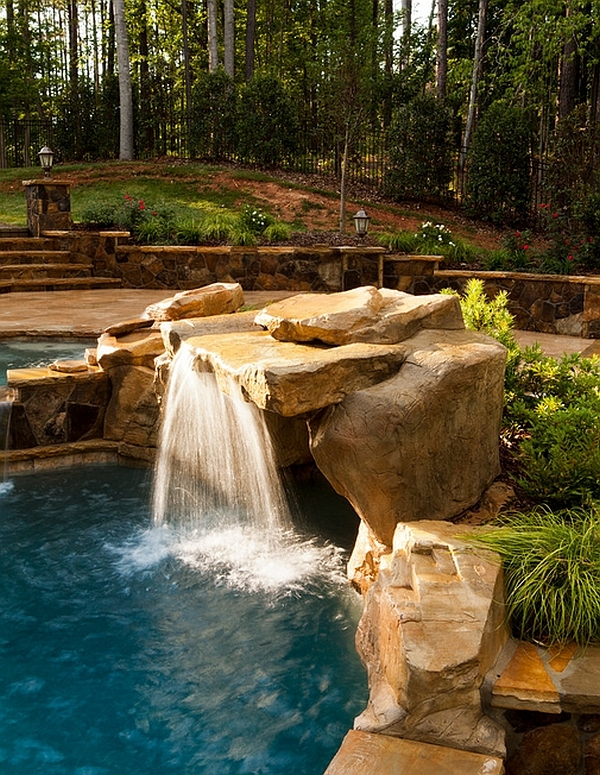 For example, sometimes a simple water circulating mechanism with added frills can double as a wonderful pool waterfall. 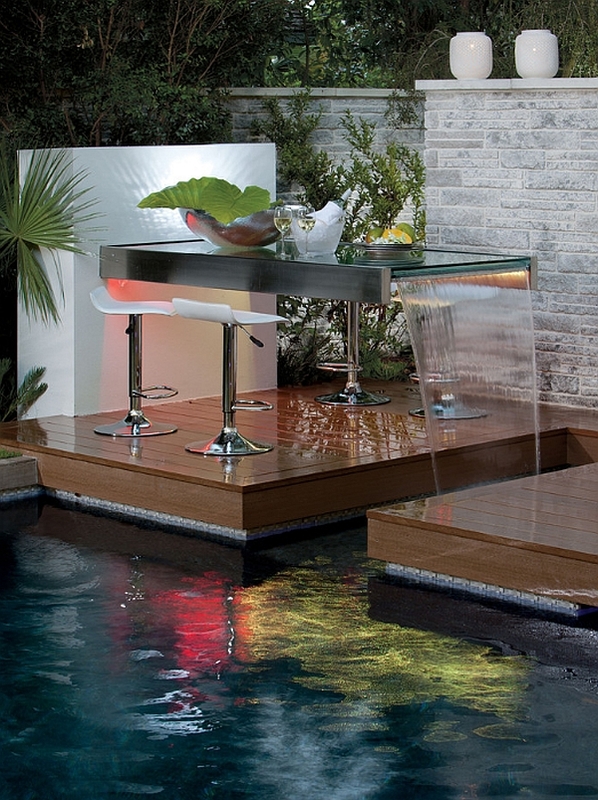 Water fountains can also do the job when used in a smart manner, and while they might not be traditionally defined as ‘waterfalls’, they seem far more appropriate when taking a contemporary approach. 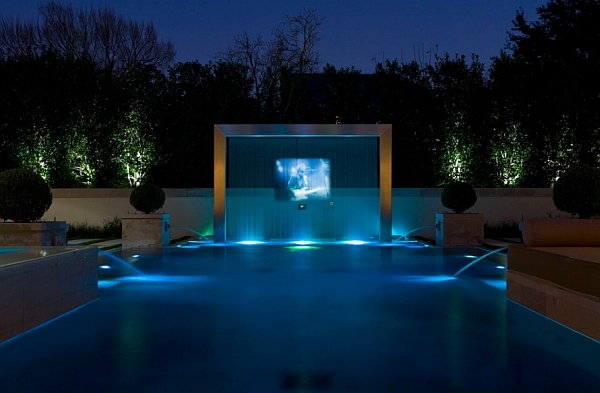 Custom water screen with a rear projection system! 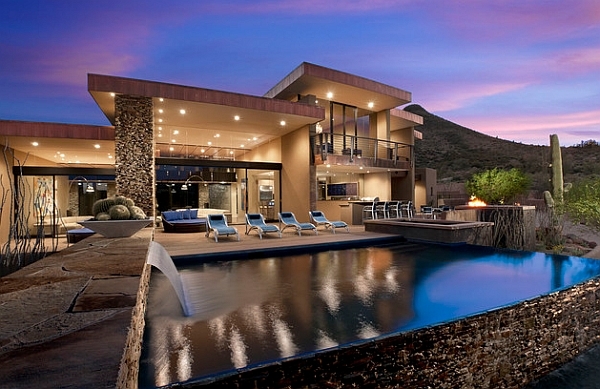 Keeping it simple and stylish! 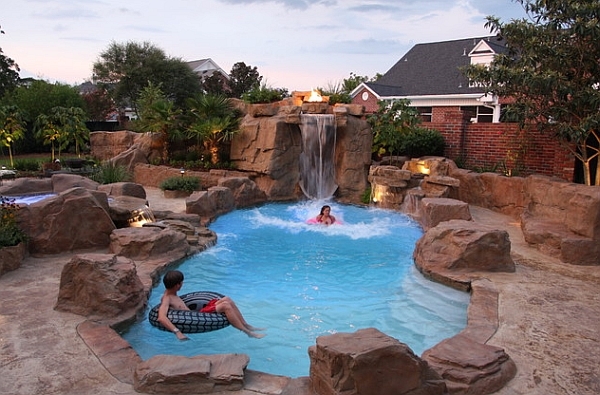 Adding a pool waterfall obviously elevates the grandeur of your backyard, but it often comes with a hefty price tag. 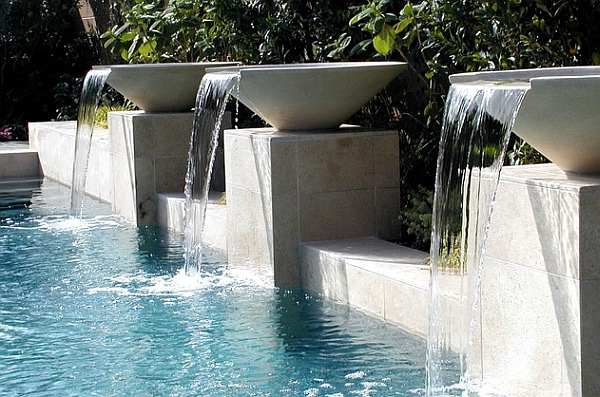 For those looking to incorporate this feature in a more frugal fashion, improvised water fountains are the next best option. 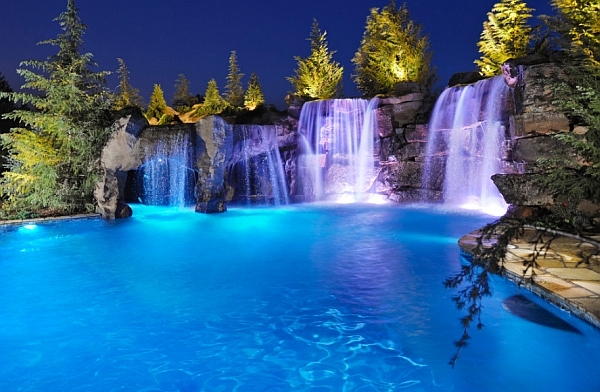 Dramatic, captivating and serene pool waterfalls transform the world that they touch with fluid charm!